The recent discovery of a palace and tax collection building belonging to King David is a bit ironic. It was the first major discovery of buildings connected to King David in Israel. It’s ironic a tax collection building was part of this significant find, because years later it was the tax policy of David’s grandson that ripped Israel in half — forming Judah and Israel. 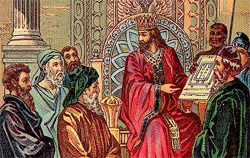 The problems started when David’s son Solomon became king. He undertook massive building projects requiring him to raise taxes to pay for them. Though Solomon constructed the temple, it was not a major expense as David — who was forbidden from building it — had already gathered most of the material needed and even had the workmen in place (1 Chronicles 22:2-4). Rather it was the construction of a second palace that became the root of the problem. Solomon was not content to live in his father’s house and built a huge palace to house his 700 wives and 300 concubines (1 Kings 7:1-11). It took 13 years to construct, compared to just 7 years for the temple. It appears the palace was built largely due to Solomon’s marriage to the daughter of the Egyptian pharaoh. It proved very controversial. People in Israel were obviously questioning its necessity, because Solomon felt compelled to publicly justify its construction. People were upset and Solomon was in old fashioned damage control. Solomon had married the daughter of the Pharaoh. Because she was Egyptian, Solomon said she couldn’t live in David’s palace because the Ark of the Covenant had passed through the old palace. Reading between the lines: his Egyptian wife obviously hadn’t converted to Judaism (1 Kings 11:1-5) and she was probably demanding a room where she could worship her Egyptian gods. Solomon rationalized her presence in the old palace would desecrate this sacred ground. So he built a palace primarily for her, complete with Egyptian gods and it was all paid for by the citizens of Israel. When Solomon’s son Rehoboam became king (1 Kings 12), he was aware resentment was brewing in Israel over his father’s burdensome taxes (v . 3, 4). Rehoboam consulted with his father’s advisers and they told him to reduce the tax burden (v 7). But when Rehoboam’s young friends said raise the taxes, Solomon’s son took their advice instead. Rehoboam said, “‘Whereas my father loaded you with a heavy yoke, I will add to your yoke; my father disciplined you with whips, but I will discipline you with scorpions’” (v 11). This refusal to reduce taxes resulted in Israel being split into two nations through a rebellion led by Jeroboam (v 16-24). In Israel, taxes were paid in a multiple of ways. It could be paid in money (gold or silver) or actual produce such as a share of a person’s crops. A third form involved giving time to construction projects. This is what Rehoboam was referring to when he said “I will add to your yoke; my father disciplined you with whips, but I will discipline you with scorpions” (1 Kings 12:11). The whips were used by construction supervisors to punish workers considered slacking off. It was a direct reference to the forced labour being “levied” for construction projects. Levied refers to taxation. People’s time was taxed in the same way as their money. They wouldn’t be working full time on the projects as they still had to earn their own living, but the time the Israeli men were forced to give to these projects was obviously a major irritant. The Israelites experienced much the same thing in their Egyptian captivity. They were required to produce a quota of bricks for the Pharaoh, while at the same time growing their own crops and caring for their livestock. When the Egyptians required them to gather straw — a necessary ingredient for brick making — it was essentially a tax increase, as they needed to give more time (Exodus 5:6-8). This isn’t much different from what we have today. In Canada, the Fraser Institute portrays Canada’s tax burden in a unique way — Tax Freedom Day. Each year, the Institute calculates the total federal, provincial and municipal taxes paid by an average family. It then calculates how long they work to pay their tax bill. In 2013, the average Canadian family paid 43.6% of its income in taxes. This means they worked until June 9, 2013 for the government. June 10th is Tax Freedom Day — the day Canadians finally start working for themselves. We notice a significant difference in tax policy between David and Solomon. While the materials were paid for by the Jews, it was the foreigners living in Israel who were taxed to actually construct the temple. However, when Solomon came to power, he instituted so many building projects the foreigners couldn’t handle all the construction on their own, so Solomon demanded the Jews give their time. By the time Solomon’s reign came to an end, the Israelis were sick of the excessive tax burden.